Replace the system disk (non-public image): The previous system disks are released. 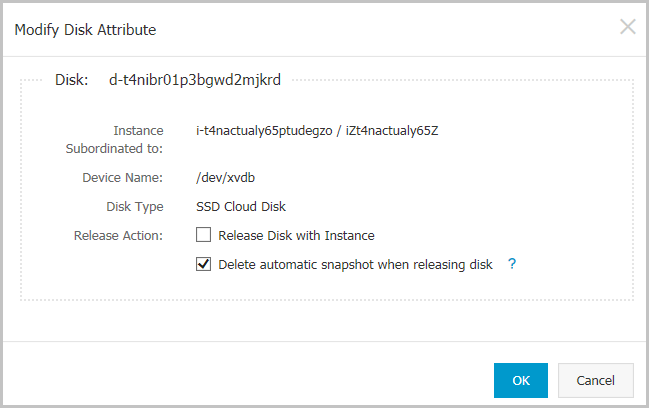 If an automatic snapshot has been set up to release with the cloud disks, the automatic snapshots of the previous system disks are automatically deleted. In the left-side navigation pane, click Block Storage > Disks. Select the disk that you want to configure and then, in the Actions column, click More > Modify Attributes. In the Modify Disk Type dialog box, select Delete Automatic Snapshots while Releasing Disk, and then click OK.